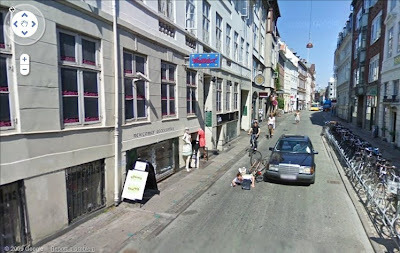 Google launched their Street View service in Denmark a couple of days ago and there was one photo they enjoyed so much that they leaked it to the press in conjunction with the launch. "It's actually a funny story", explained the head of Google's Danish office, Peter Friis to DR News. "He was riding along when he spotted the Street View car and he wanted to take a photo with his mobile phone and that's when he toppled over." He explained that the man on the bicycle is a friend of one of the employees at Google Denmark and that he called his friend afterwards to tell him he was in the photo. "The man himself thinks it's a funny photo", said Peter Friis. According to Friis it's pure coincedence that the episode was captured on camera. He stresses that the photo wasn't added in order to create hype about the new service. "The van only drove down that street once and the camera mounted on the van took the photo. Our vans have driven 32,057 km through Denmark so it's not strange that certain sequences are caught on camera." Update: The man in question was interviewed on the national news tonight. 15 minutes of fame and all that.